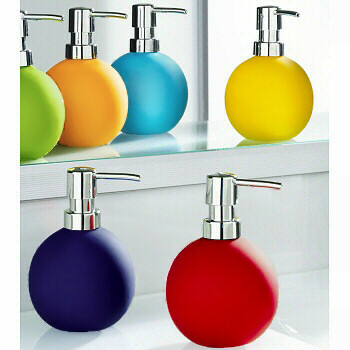 Round soap or lotion dispenser with a non-slip rubberized matte coating over porcelain. Designed and produced by well-known German brand Kleine Wolke, established in 1968, and is backed by their quality guarantee.. The weight of these soap dispensers gives you the immediate feeling of high quality and you cannot beat the FUN colors. Red: Deep red dispenser with non slip matte finish. Would look fantastic with any of our deep red bath rugs. Orange: Bright orange with a hint of yellow. Really will add a nice eye catching punch of color to the top of your vanity. Spring Green: Spring time all the time! Stunning yellow green soap or lotion dispenser. Fantastic with our Keno or Relax bath rugs. Turquoise: Beautiful blue like a tropical sea. The Venice rug in aqua is a great match along with the Caro in aqua. Sorrento Azure Blue: Deep blue with a hint of purple.